Categoría 30 Varones: CRISTIAN PACHECO 15.02 Olavarría. Categoría 45 Mujeres: MIRTA VAZQUEZ 19.39 Necochea. 1 CRISTIAN PACHECO 15.02 Olavarría. 2 DIEGO SUAREZ 15.45 Necochea. 8 MARTIN MAGADAN 22.16 Necochea. 7 GUILLERMO BERMEJO 20.23 Necochea. 7 JORGE SIGOLI 22.20 Tres Arroyos. 4 MIGUEL ALVAREZ 21.13 Necochea. 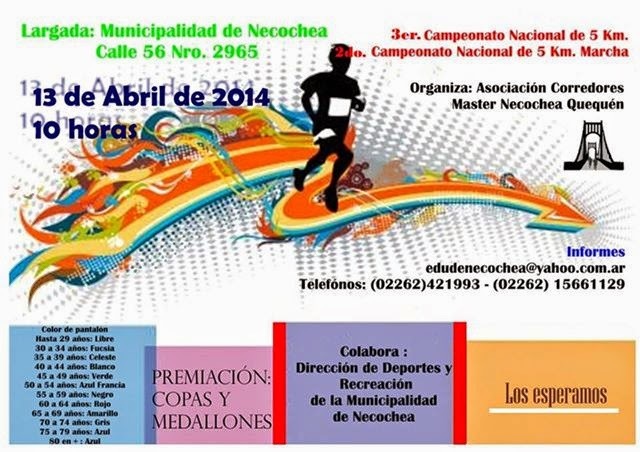 2 ERNESTO ORTIZ 26.49 Necochea. 1 OSCAR CAZABAT 33.14 Necochea. 2 RODOLFO SUAREZ 28.29 Necochea. 4 GABRIELA LAFFARGUE 27.56 Necochea. 3 MONICA BOLONTRADE 24.40 Necochea. 1 MARIA DEL CARMEN LUNA 25.27 Tandil. 1 HERMINIA CALERO 33.12 Necochea. 1 ELICA ROMAY 31.12 Tandil. Categoría 60 Varones: ROBERTO VILLA LORENZO 27.14 Mendoza. CLASIFICACIÓN 5 Km. MARCHA 5000. 1 VERONICA DA COSTA 35.01 Necochea. 2 CLAUDINA CARNOVALI 29.55 Tandil,. 2 AMANDA ITURRES 30.55 Tandil. 1 ELENA GONZALEZ 37.34 Necochea. 1 HERMINIA CALERO 42.52 Necochea. 1 MARCELO VIDAL 36.06 Balcarce. 1 SERAFIN VILLAR 28.55 Tandil. 5 EDUARDO CHASPMAN 33.47 Balcarce. 2 MARIO RODRIGUEZ 38.40 Tandil. 1 ADOLFO MONTALIVET 42.52 Necochea. Publicado por Hugo A Roldan en 3:38 p. m.